As far back as 1897, Pellegrino Artusi, author of La Scienza in Cucina e L’Arte di Mangiar Bene, (The Science of Cooking and the Art of Eating Well), included three recipes for ‘polpetti’. In Tuscany they were a favourite of housewives who frugally made them using scraps of meat and bread to feed their hungry families. We are of course referring to the (not so humble) meatball. Here we’ve jazzed up the recipe with Parmesan and a kick of chilli to tickle your taste buds. Boil 600ml of water. Very finely chop your marjoram. 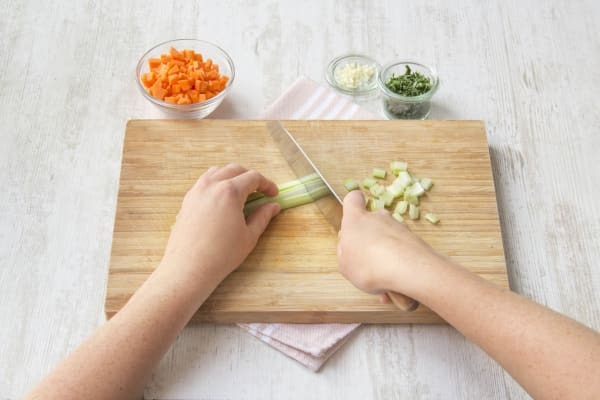 Peel and finely chop the garlic and celery. Peel the carrot and chop into 1cm cubes. Grate your parmesan. Heat 1 tbsp of olive oil in a saucepan on medium heat. Add the garlic, celery and carrots and cook for 5 mins. Tip: If the ingredients start to brown, turn the heat down a little. Add the hot water, the stock pot and the tin of tomatoes. Leave the mixture to gently bubble away while you make the polpetti. 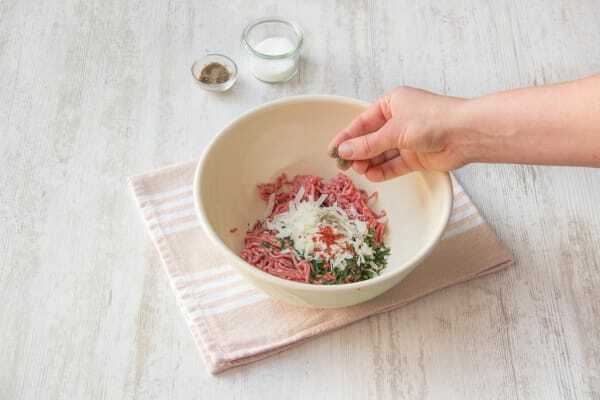 In a bowl mix together two-thirds of the marjoram and the beef mince. Mix in three quarters of your cheese and the chilli flakes (to taste) as well as 1/4 tsp of salt and a few grinds of pepper. Divide the meat mixture into balls half the size of a 50 pence coin. 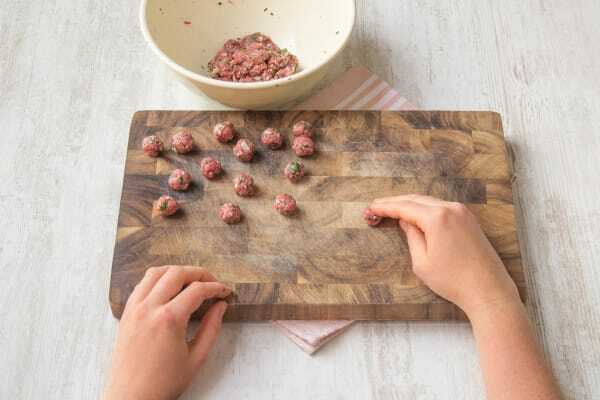 Roll the balls on your chopping board to get them nice and round. Now add your pasta into the soup and cook for around 12 mins. 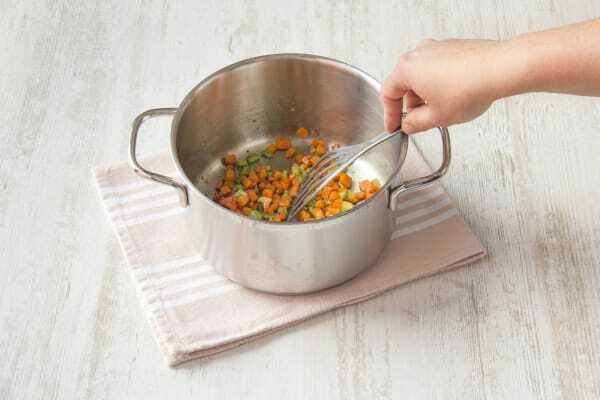 Tip: Pasta is ready when it is cooked through but has a slight firmness left in the middle. Heat 1 tbsp of oil in a non-stick frying pan on medium-high heat. Cook the polpetti in the pan, being careful not to break them. When the polpetti have just browned off, remove them from the pan. Tip: Don’t overcook them as they will dry out. Turn your oven to 100 degrees and slice your ciabatta in half, before warming in the oven for 5 mins. 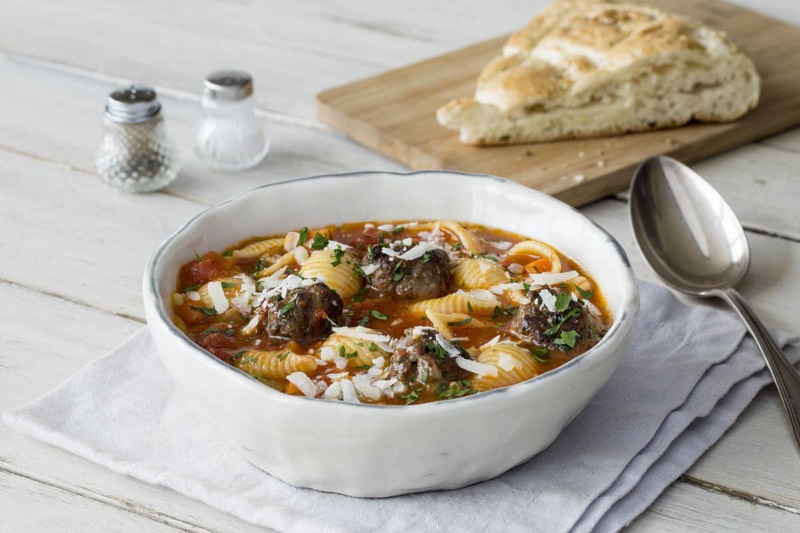 With 5 mins to go until your pasta is cooked, add your polpetti into the soup. Serve with a sprinkling of grated cheese and the remaining marjoram. Use your bread to ‘fare la scarpetta’ (this means ‘do the shoe’ in Italian, aka mop your plate clean! ).